I’m back to drawing again because I really enjoy it and want to practice more while I book my next craft fairs for the months ahead. 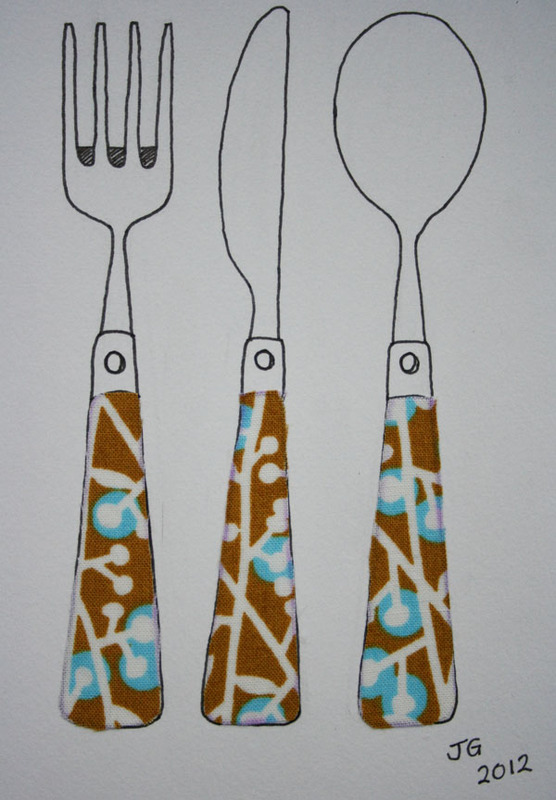 After the Christmas order rush it’s nice to sit back and have a play with things like this cutlery drawing, using Heather Moore fabric again, because I love it so much. It’s funny, this time last year I was a month away from finishing work and just had plans to decorate the house, finish my Interior Design course and learn how to screen print (oh yes, and learn how to make a lampshade). Now it’s January again and I feel a lot closer to knowing what I want to do when I grow up 🙂 hehe! I have lampshades to print and make for a gallery in Leeds, lampshade workshops to look forward to in February and March. I just need to find a regular local craft fair I like, if anyone knows any near Maidenhead please let me know!